polybore: Crawling baby mobile protection unit. Crawling 9mth old babies can really get around the house finding lots of interesting things to eat, dismantle and bang their heads on. It is an age old problem but being a new(ish) dad Polybore can look at this problem with a fresh pair of eyes and thinks that a solution may just be around the corner. To give you an idea of what this innovation may look like on completion here is a glimpse of what has influenced the thought process. 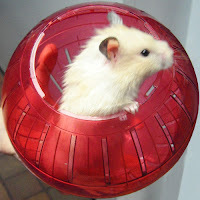 First off we have the hamster exercise ball. 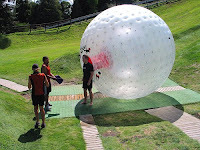 And secondly by the Zorb which, if you have not encountered one before is an inflatable human adult sized version of the hamster ball. You may see where Polybore is going with this. Not sure how the sound proofing is going to work though, all suggestions gratefully received.